'Trekstock is proud to announce its’ limited edition, pop-up shop launching July 1st-15th just off London’sworld famous Carnaby Street. To mark this occasion, Trekstock have collaborated with ten international bands/artists with a UK presence over the upcoming festival season to design a limited edition charity t-shirt kindly supplied by fashion brand Gio Goi. on twitter to find out when your favourite artists will be in store. Doubling up as a gallery space, exhibiting exclusively signed artwork, the Trekshop has also collaborated with some of the UK’s best street artists to bring the pop-up shop to life. 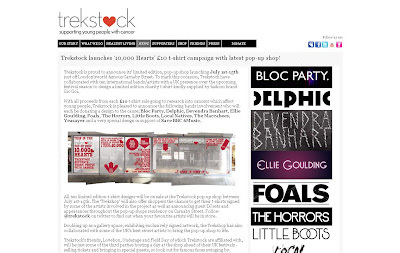 Trekstock ‘10,000 Hearts’ Pop-up store, 65-67 Broadwick Street, W1.